Fans for the Cure was delighted to support All Hallows High School’s Prostate Cancer Walk last weekend, held on a beautiful Saturday afternoon. Organized by the students at All Hallows, an all-boys Catholic high school located in the South Bronx, the prostate cancer awareness walk covered the neighborhood located around Joyce Kilmer Park. As a charity dedicated to raising prostate cancer awareness in communities where the risk of the disease is the greatest, Fans for the Cure was pleased to be supporting another event in the South Bronx, which is home to many African-American men. Along with Afro-Caribbean men, African Americans are a demographic group considered to be particularly at-risk for developing the most serious cases of prostate cancer. 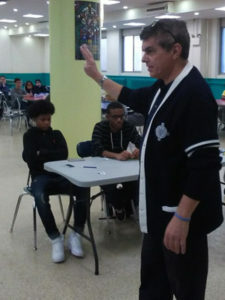 Prior to joining the approximately 80 students on the walk around their school’s community, Ed Randall was invited by the school’s administration to share educational information with the teens about prostate cancer and the importance of having baseline PSA screenings, especially among African Americans and those men who have a history of prostate cancer in their families. Ed also urged the students not just to share the message of awareness that afternoon during the walk but also to remind the older men (older than the students anyway…) at home that testing and early detection lead to best outcomes and keep families together. As a graduate of All Hallows High School, Ed was particularly moved by how walking the hallways both stirred old memories and served as the starting line for eighty kids in learning to give back to their communities. At Fans for the Cure, we recognize that there are three key factors to determining the risk of developing prostate cancer – age, race or ethnicity, and family history. Given the higher risks for the disease among African-American and Afro-Caribbean men, the current medical recommendation is for them to begin testing at age 45. For men with at least one first-degree relative (father, brother, or son) with prostate cancer, baseline PSA screenings via a simple blood test should begin at age 40. Men in all other racial and ethnic groups should try to have a baseline PSA test no later than at age 50. Again, early detection provides men and their doctors with more treatment options, including several which are non-invasive (e.g. active surveillance). As we approach our fourteenth year as a charity, we are increasingly focused on taking our messages about prostate cancer and the value of early testing and on-going monitoring to where they are needed most. If the men in your community or organization face higher risks of prostate cancer, we ask that you connect with us. We welcome the opportunity to discuss organizing screenings and seminars in your community.